Howard L. Graef, D.D.S., P.C. or Martina S. Richardson, D.D.S. will design your partial denture so that the chewing forces are evenly distributed over the entire surface are of the remaining teeth and soft tissues. Changes to your remaining teeth may be recommended to help equalize these forces. Metal partials are generally preferred as they are structurally superior. They are thinner and more hygienic than an acrylic partial. Acrylic partials are typically used as a transitional or temporary partial. Howard L. Graef, D.D.S., P.C. or Martina S. Richardson, D.D.S. will consult with you to determine the appropriate partial for your situation. Ask Drs. 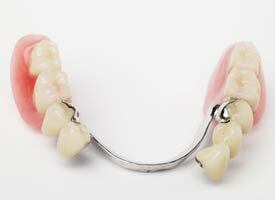 Graef and Richardson about precision partial dentures, in which special attachments are used to enhance fit and remove unsightly metal clasps: 248-589-2021.